Beauty given physical substance is a magical thing. Robert Taylor’s poetical retrospective, Remnants of a Season, is as magical as they come. Brought out to mark Taylor’s 70th birthday, this book is at once a chronicle and a collection of his works. And a piece of publishing art in its own right, too: it would be a disservice not to (initially, at least) judge this book by its cover. So I will begin there. From the onset, Remnants of a Season looks exactly like Taylor’s collected poetical works ought to look — naturally poetic and artistically serious (a hint towards the contents). The texture of the cloth binding is nicely tactile; the stamped cover panels are elegant and well-designed. It has the perfect heft about it: it feels good in hand, and it feels sturdy, which are things that can’t be said for every hardcover poetry book out there. Beyond the covers there is even more judge-worthy excellence: matte black end sheets open and close the volume with solemn dignity; there are classically sewn signatures of archival-quality pages. The pages are well laid out, and there is a clear crisp font throughout. Taylor’s bind-rune is included beneath his name on the title page. The hand numbering (mine is number 34) is tastefully placed and sized — purveying neither ostentation or disregard for the fact that this is an edition limited to 500. These poems are the work of a lifetime. It is our hope that this edition will present them in the way that they deserve — for everyone of of you reading these words, and for readers yet to come. 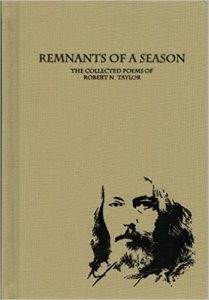 Remnants of a Season is introduced by Joshua Buckley — again of Ultra Publishing and also of TYR journal fame. Buckley does a great job, managing to immerse us and engage us in the life and works of a deeply lived, vastly faceted artist in a succinct six pages. An index to the first lines (nicely classic touch), a select bibliography of Taylor’s published works, and a discography of his music conclude the book and, balanced with the introduction, create a sturdy frame, if you will, around the contents. Again, nicely done. Taylor’s poetry is divided into five sections, Epic Poems, A Gothic Trilogy, Lyric Ballads, Other Poems, Haiku, like a pentagram, each point revolving around and creating the whole. This is no meaningless modern poetry. This is no self-indulgent verse. This is poetry wrought deep from the soul and the life of an artist — not just an artist (everyone is an artist these days) — an artist who has woven his way into and through this thing we call life, an artist who can wring poetic meaning from pain, an artist who can find beauty even in its own destruction, an artist who can — like Allfather Odin himself — travel worlds, metaphorically hanging from the axis of the world tree, trading visions for wisdoms. The epic poems are exactly what they are supposed to be: epic in length and scope. They are the sort of poetry that we do not see much of these days, and it is a pity — (or perhaps it’s not, most people wouldn’t be able to render such works as well as Taylor. There is little worse than a badly written epic). Taylor’s epic writing is ruggedly alive — even while it contains a fluid gracefulness to it. Fell dying in the dark. Note, please, the repeated use and placement of the word “fell”: its first use foreshadows the fate of John “The Red”; the second underscores the inevitability of it. One “fell” ends a line of action, the other begins one. Masterful poetics. Unchanging swirl and twist design of grain . . .
Sacred colors mark the changes of the gray man, from “A shiny black-bead rosary . . . Black-shawled praying homage / To the black abyss within” passing to “A vision before me! Stalwart and standing / with blue patterns twining” and “Three feathers up-standing: / The red of the falcon, / The white of an eagle, / The black of the raven’s satin jet wing”, all of which the gray man encounters on his way to becoming “that which . . . I am!” Taylor makes a powerful poetic comment on searching for and finding one’s “savage Cro-Magnon, Ancestral” nature in today’s anything but sacredly-authentic world. The Lyric Ballads, section three (a most mystical number), is my particularly favorite section. It probably contains the most familiar pieces to fans of Changes (Taylor’s neo-folk group) as many of the lyric poems here (“Song of Pan,” “Waiting for the Fall,” etc.) are available as songs on various Changes albums (another reason why the discography at the end of the book is so valuable). There are some lovely poetic gems here — souvenirs, if you will, of the travels of Taylor’s mind as it ranges out across the mystic cosmos and back to here. Always very firmly here. In an ordinary poet’s hands, using the word twilight twice in consecutive lines would come across as amateurish redundancy — but Taylor uses the repetition to underscore with emphasis the inevitability of closure, even to dreams. Like a hummingbird . . .
A rustle of shriveled leaves. The way of Wyrd unfolds. In the flux of time. There could be no better words to close the book on, no better summation of the work of Taylor. His poetry is the hallowing of moments of Wyrd in the flux of time. And in that hallowing, those moments become monuments to a man, to a culture, to the Poetic Art itself.